Disclaimer: not all colors are available in recipe. Prepare your favorite cake as directed and allow to cool. Frost your cake with chocolate frosting. Reserve one tablespoon of frosting. 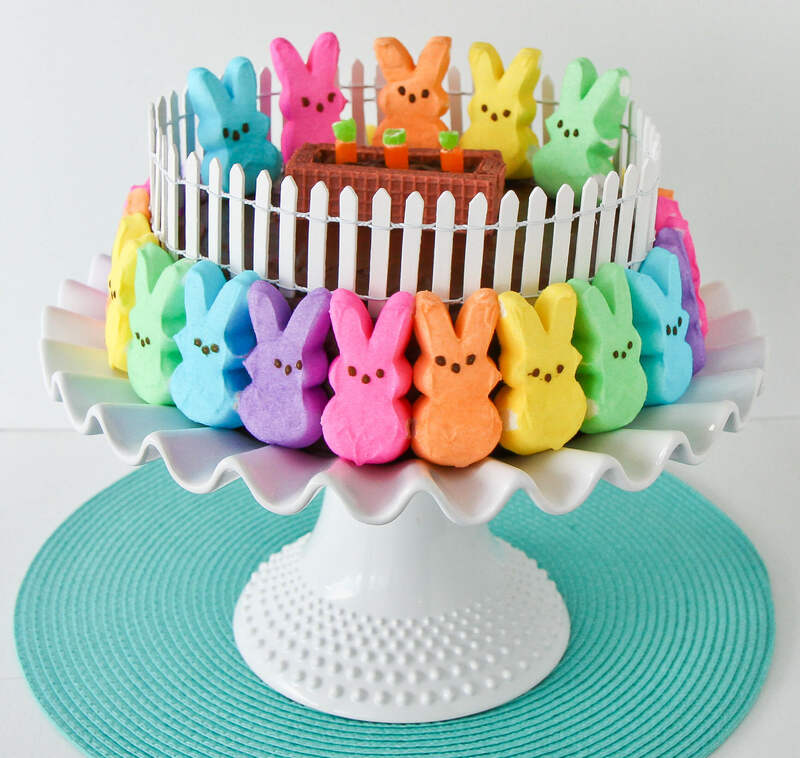 Open and separate your PEEPS and attach them to the side of your cake, wrapping around the entire cake. 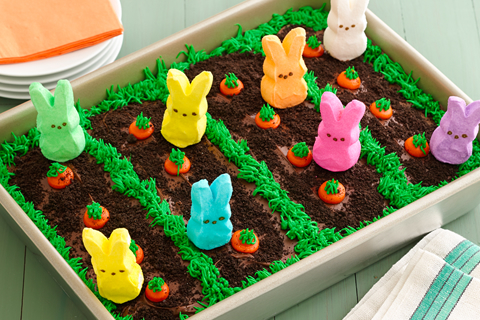 This should use approximately 24 PEEPS Marshmallow Bunnies if you put them right next to each other. For the top, create a small planter box using your chocolate sugar wafer cookies. You will use two cookies whole and the third cookie you will cut into three parts. Two parts will make up the ends of your planter box and you can use the third part to crush and fill the planter box. Top with remaining tablespoon of frosting. Cut your green MIKE AND IKE candy into three pieces. Attach a piece to the top of each of your orange MIKE AND IKE candies to create “carrots”. One side of the green MIKE AND IKE will be sticky once cut, allowing it to attach to the orange MIKE AND IKEs. Plant your MIKE AND IKE carrots in your chocolate sugar wafer cookie box. 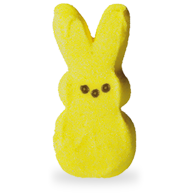 Insert a toothpick halfway into the bottom of your remaining PEEPS, and then insert your PEEPS, on the toothpicks, into the top of your cake. If desired, add picket fencing to the top of the cake. Note: Not all color variations of the PEEPS Marshmallow Bunnies shown in this recipe image may be available.